Delicious, fresh and maybe a Bit baked come these USB bun flash drives. Whether you prefer hot dogs, subs or plain bread – your computer will enjoy the extra zest. 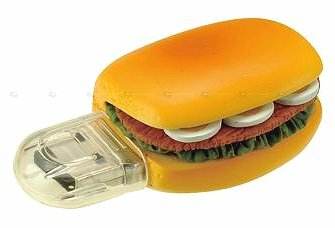 First you can save your files and logs with USB hot dogs. Which type would you like? We can offer mustard only, with a wiener size of 1-2GB, or we can offer mustard + ketchup sandwiching a wiener of up to 8GB. The first one has the USB plug at the end whereas the ketchup version needs to be “broken” in half to expose it. That way you can have one half hot docked to your port and the other one as an in-between snack. Another way to sandwich your data is with a sub flash drive. Though filled with pastrami, egg and lettuce, it leaves room for 1-2GB worth of additives. And with an amazing recipe secret it turns these into preservatives once the sandwich flash drive is unplugged. I’m not sure if it’s really healthy but I guess your computer and gadget could care less. If you prefer it simpler, you can also bake your data with the french bread flash drive. With 1-2GB it’s well served as a digital enhancement to any bread and butter life. No matter if you live in France, Britain or the US. Unfortunately USB buns are not really digestible despite their yummy allure. I know, what a bunner. For your computer however it’s pretty easy to break down the bunary code. And that, I say, makes them worth their salt. Those things would make great stocking stuffers. They’re actually quiet cute really. I like the burger designs. lol. These kinda designs attract me. These look great, but maybe not for adults! lol..Its good for kids who are just starting to use computers or maybe if your working in a fast food outlet. that would just be ideal dont you think!! Are they edible? Great idea! .-= BB Kent´s last [blog post] ..Sandwich =-. Haha.. Hilariously innovative if you ask me! Im getting myself one of those! Can anyone please tell me how do order them?? .-= white file cabinet´s last blog post ..Response cached until Wed 17 @ 14:16 GMT (Refreshes in 23.44 Hours) =-. just follow the ebay or amazon links. I know ebay doesn’t always have them but amazon usually has them on stock. LoL How cute! Definitely going to have to buy one of these for a friend Haha Hopefully he won’t eat it at lunch time! Those are great, the hot dog one is making me feel hungry. A friend of mine loves novelty stuff like this but is on a diet – I might buy him one just to tease him a little! The sandwich flash drive is sweet! .-= John @ Magic Jack´s last blog post ..MagicJack compared to Vonage & Skype =-. Very creative. I like the USB sandwich. I am just wondering if this is available in UK. I may need this to save all my essays. .-= Adam @ Custom Essay´s last blog post ..MagicJack compared to Vonage -amp Skype =-. I dont see any listings for the UK right now but it should be fine to have them shipped from the US. Holy cow those are awesome! Don’t know how I ended up here looking for grooming supplies but I might have to buy some of these for client giveaways! HahA! these are great. What a cool USB drive. I’m definitely buying one for myself. .-= Dell Desktop´s last blog post ..Dell Studio XPS 9100 =-. I am trying to source 50 units of the bread flash drive, as featured on your website. Ideally these would be printed with a one colour logo on the side, if this were possible. Could you advise on appropriate costs and lead times please ? If the logo printing is not available, then please cost on supplying without. I would like to order some USB Bread Flash Drive. How can we proceed? Can you make me an offer ? I would be interested with 20 of them.